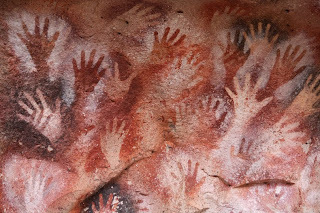 Ancient handprints, rock paintings started appearing on rock walls around the world at least 30,000 years ago. Cave of the Hands is famous for the paintings of hands. 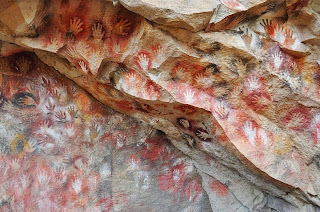 Numerous waves of people occupied the cave, and early artwork has been carbon-dated to ca. 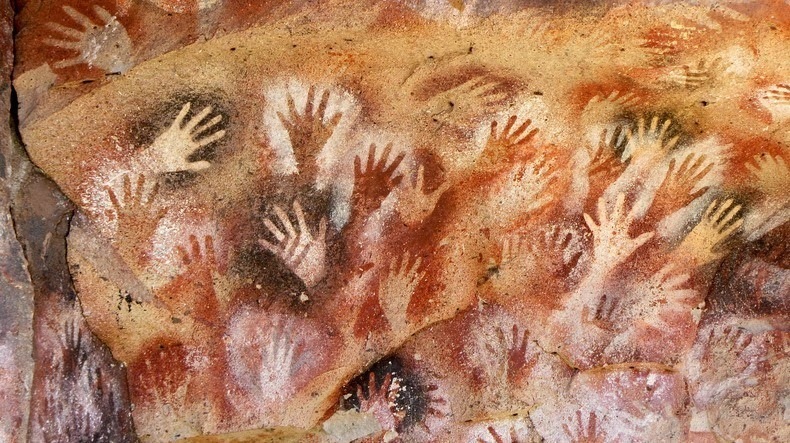 9300. 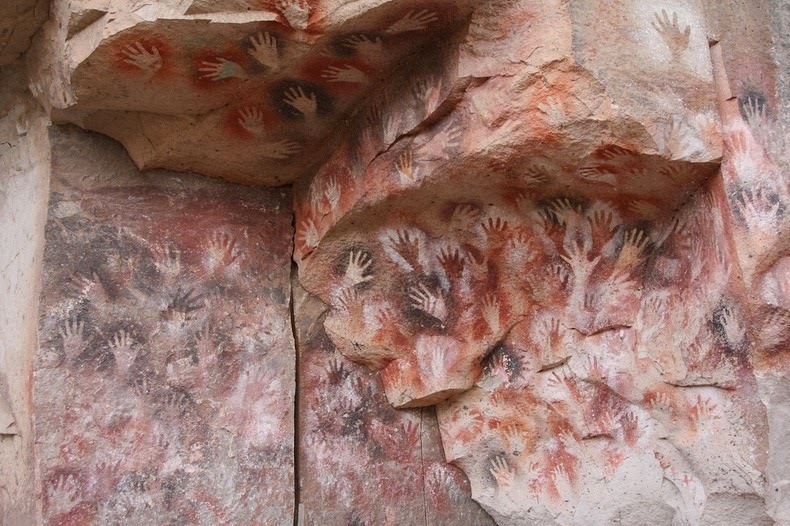 A Cueva de la Manos in Patagonia Argentina contains a brilliant assemblage of cave art. Cueva de las Manos”, exactly “the Cave of Hands”, is situated in Río Pinturas, in the province of Santa Cruz, Argentina, about 163 kilometer south of the town of Perito Moreno. 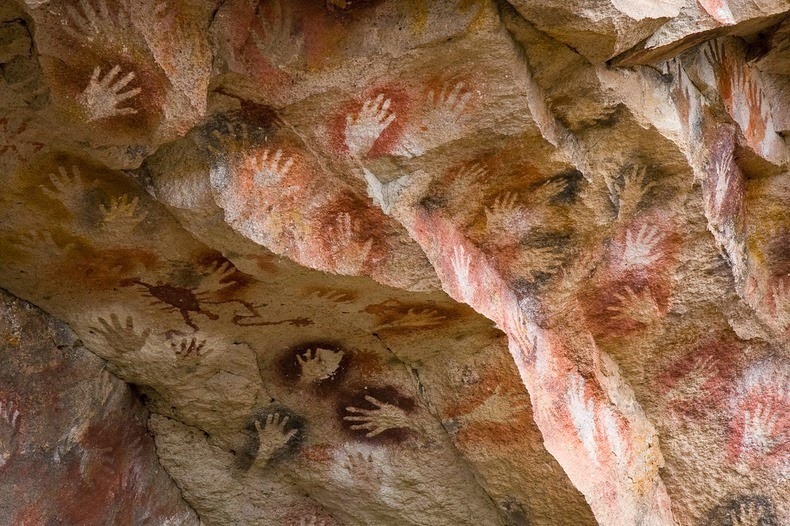 The cave of hands gets its name from the cluster of stenciled outlines of human hands that appear on the cave walls. 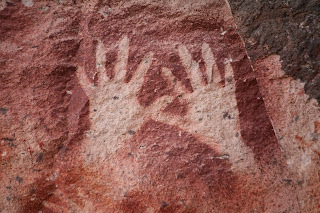 These beautiful rock paintings were made by hunter-gatherer communities estimated to have lived between 13,000 to 9,200 years ago, as determined from the leftovers of bone-made pipes used for spraying the paint on the wall of the cave to make silhouettes of hands. The cave entrance is screened by a rock wall, which is well covered by many hand stencils. 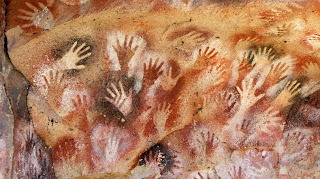 Therefore; most of the hands are left hands that suggest painters detained the spraying pipe with their right hand. 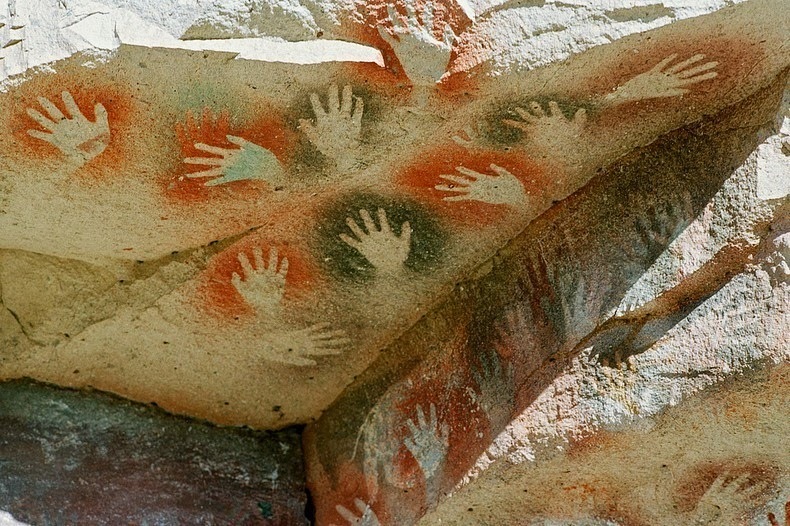 Moreover hand prints; are also depictions of human beings, and animals such as guanacos, rheas, and felines, as well as geometric shapes, zigzag patterns, representations of the sun, and a number of hunting scenes, which portray a variety of hunting strategies with animals being surrounded, trapped in ambushes, or attacked by hunters using their throwing weapons, round stones known as bolas. 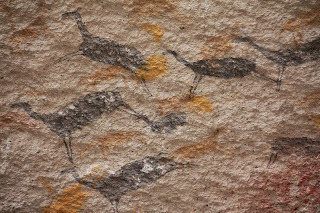 Several views show individual hunters and others groups of more than 10 men. 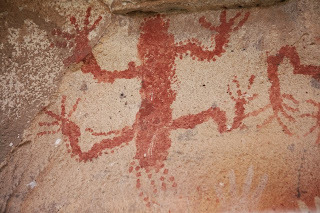 The paintings belong to three distinct cultures. 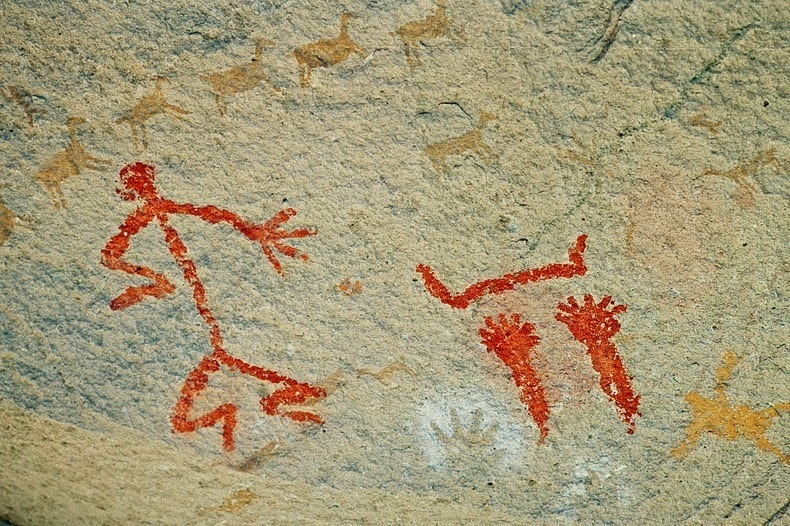 The first human group was long-distance hunters whose focal prey was the guanaco. 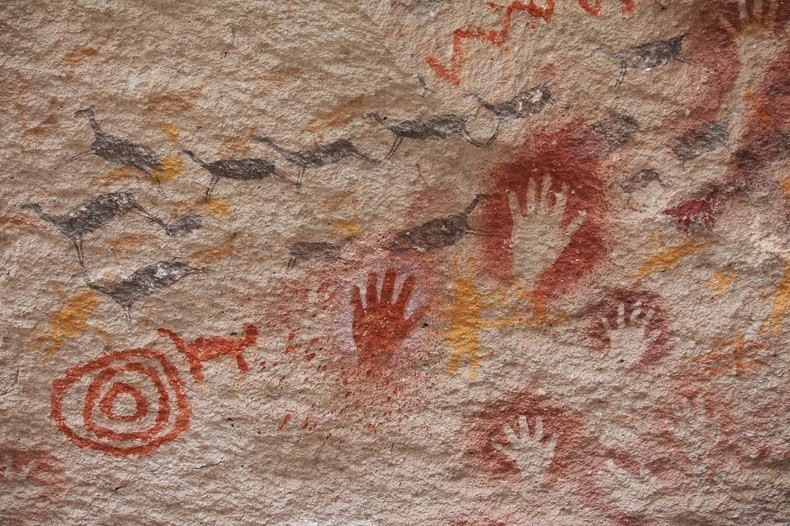 Approximately 7,000 BC a 2nd cultural level can be recognized, distinguished by hand stencils. Hunting scenes are no longer found during this age. There are also some examples of stencils of the feet of the American ostrich. 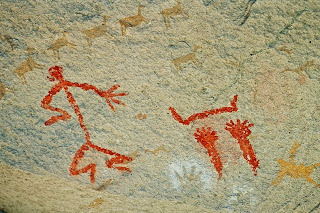 This culture lasted until circa 3300 BC, when the art became more schematic and included highly stylized zoomorphic and anthropomorphic figures. The last cultural started about 1,300 BC. Its art executed in bright red pigments, concentrated on abstract geometric figures and highly schematic representations of animals and humans. 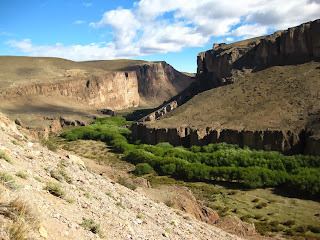 It is supposed to have been the work of the historic Tehuelche hunter-gatherers who inhabited the vast area of Patagonia when the first Spanish traders and settlers arrived.